7 Hereford is located on the west side of Hereford, between Beacon and Marlborough, with 435 Beacon to the north and 9 Hereford to the south. 7 Hereford was designed by Alfred S. Bither, architect, and built in 1879-1880 by Edward E. Chapin, mason, for real estate dealer Henry Whitwell on land owned by his brother and partner, Samuel Horatio Whitwell, one of four contiguous houses (435 Beacon and 7-9-11 Hereford) built for speculative sale. Henry Whitwell is shown as the owner on the original building permit applications for 435 Beacon and 7-9-11 Hereford (one application for three houses), both dated December 13, 1879. In his Houses of Boston’s Back Bay, Bainbridge Bunting indicates that all four houses “were planned as two stories with a mansard roof. Fourth stories were added for purchasers to two of the four houses [7 Hereford and 11 Hereford] by the speculative builder before the row was finished.” Bunting does not indicate his source for concluding that the additional stories at 7 Hereford and 11 Hereford were added before the houses were completed, but this information may have been shown on the final building inspection reports, to which he may have had access (the reports no longer are available). However, the insurance maps for the period imply that the additional stories were added somewhat later: the 1887 Sanborn map shows all four houses as being two stories with a mansard roof, whereas the 1897 Sanborn map shows the addition of the extra floors at 7 Hereford and 11 Hereford. Bunting also indicates that 435 Beacon, 7-9-11 Hereford, 364 Marlborough, 27-29-31 Hereford, and 216-218 Commonwealth – all built in 1879 – were designed by R. S. Bither. This is a misreading of the handwriting on the permit applications. It is clearly written as “A. S. Bither” on several of the permit applications, and is less legible on several others. 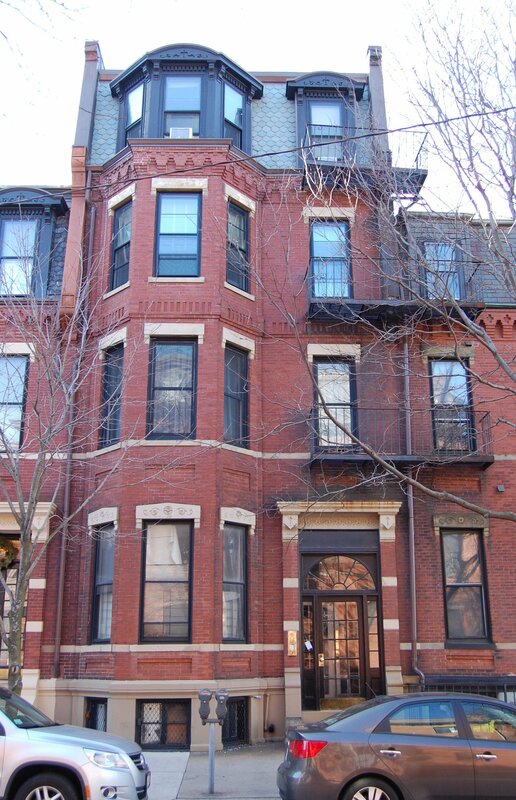 There was no R. S. Bither listed in the Boston City Directories at any time in the 1870s or 1880s, whereas Alfred S. Bither was a practicing architect in Boston from 1870 to 1880. Samuel H. Whitwell purchased the land for 435 Beacon and 7-9-11 Hereford on November 29, 1879, from Edwin Markland White. He had purchased the land on October 24, 1879, from the estate of Daniel Davies, a housewright and master carpenter who had died in June of 1878. He and his wife, Amity Bacon (Hastings) Davies, had lived at 449 Beacon. The land was part of a larger parcel Daniel Davies had purchased on June 20, 1866, from the Boston Water Power Company (Daniel and Amity Davies’s daughter, Susan, was the wife of Grenville Temple Winthrop Braman, treasurer of the Boston Water Power Company). Click here for an index to the deeds for 7 Hereford, and click here for further information on the land on the south side of Beacon between Hereford and Massachusetts Avenue. When he sold the houses at 7-9-11 Hereford, Samuel Whitwell included in the deeds a four foot wide easement across the western boundaries of 9-11 Hereford to provide access to the alley for 7-9-11 Hereford. On November 1, 1880, 7 Hereford was purchased from Samuel Whitwell by Arthur Hobart, treasurer of the Aetna Mills, woolen manufacturers in Watertown. His mother, Anna Mann (Browne) Hobart, the widow of Aaron Hobart, lived with him. They previously had lived at 22 Dover, where Aaron Hobard had died in May of 1880. Arthur Hobart married in November of 1881 to Anna Turner and they made 7 Hereford their home. His mother continued to live with them until about 1885, when she moved to Newton Highlands. Arthur and Anna Hobart continued to live at 7 Hereford in during the 1893-1894 winter season, but moved thereafter to 109 Sedgwick. On November 15, 1894, 7 Hereford was purchased from Arthur Hobart by Miss Mary H. Bartlett. She previously had lived at the Hotel Vendôme. She continued to live at 7 Hereford during the 1903-1904 winter season, but moved thereafter to The Tuileries at 270 Commonwealth. She continued to own 7 Hereford and lease it to others. During the 1904-1905 winter season, 7 Hereford was the home of Florence L. (Clarke) Cruft. the widow of Charles F. Cruft, and their unmarried daughters, Eunice and Frances. They previously had lived at 13 Hereford. Charles Cruft had been auditor and general ticket agent for the St. Paul and Duluth Railway until his death in January of 1880. By the 1905-1906 winter season, they had moved to 254 Commonwealth. 7 Hereford was not listed in the 1906 Blue Book. During the 1906-1907 winter season, 7 Hereford was the home of Philip H. Stockton and his wife, Margaret (Head) Stockton. They had married in February of 1906, and 7 Hereford probably was their first home together. Prior to their marriage, he had lived at 390 Beacon with his widowed father, Howard Stockton. Philip Stockton was president of the City Trust Company. When it merged with Old Colony Trust Company in 1910, he became president of the combined organization. The Stocktons moved to 14 Gloucester by the next season. On May 27, 1907, 7 Hereford was purchased from Mary Bartlett by Dr. Hasket Derby, an oculist and ophthalmologist, also maintained his office there. He and his wife, Sarah (Mason) Derby, lived at 352 Beacon. 7 Hereford became the home of Hasket and Sarah Derby’s son, Dr. George Strong Derby, also an ophthalmologist (and later Ophthalmic Chief at the Massachusetts Eye and Ear Infirmary), and his wife Mary Brewster (Brown) Derby. George Derby also maintained his medical office there. They previously had lived (and he had maintained his office) at 387 Marlborough. They also maintained a home in Portland, Maine. The Derbys’ two children, Hasket Derby II and Mary Brewster Derby, were born and raised at 7 Hereford. Hasket Derby died in August of 1914. After his death, 7 Hereford was owned by a trust established under his will. Hasket Derby II married in June of 1931 to Alison Lawrence Haughton and they moved to an apartment at 7 Exeter (also living at 7 Exeter at about the same time were his uncle, Arthur Lawrence Derby and his wife, Jeannette (Barr) Derby; they usually lived at 383 Marlborough with Arthur Derby’s mother, Sarah (Mason) Derby). Hasket Derby II was sales manager for Skyways, Inc., an air transportation company, and later was a yacht broker in Dover. George Derby died in December of 1931. Mary Derby and their daughter, Mary, continued to live at 7 Hereford, and on March 23, 1933, the trustees under Hasket Derby’s will transferred the property into her name. Mary (Brown) Derby died in June of 1934. 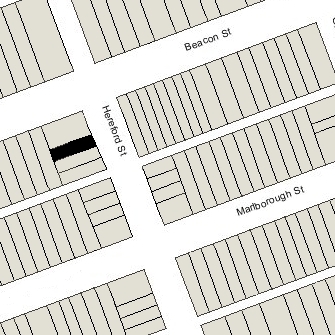 After her mother’s death, Mary Brewster Derby lived at 383 Marlborough with her grandmother, Sarah (Mason) Derby. On March 19, 1935, 7 Hereford was purchased from Mary (Brown) Derby’s estate by Warren Joyce. He was unmarried and appears to have operated it as a lodging house. On June 30, 1936, he transferred the property to the Supreme Lodge New England Order of Protection, which held a mortgage on the property. On September 27, 1937, 7 Hereford was acquired from the New England Order of Protection by Alexander Kilpatrick Williams, a civil engineer. He and his wife, Frances Maud (Cole) Williams, lived in Scituate. In September of 1937, he applied for (and subsequently received) permission to convert the property from a single-family dwelling into eight apartments. On April 28, 1939, 7 Hereford was acquired from Alexander Williams by real estate dealer Frederick E. Ordway. The property changed hands and on May 19, 1961, was acquired by Heyward Lothrop Leavitt, Jr., and his mother, Grace H. (Pencelle) Leavitt, the widow of Heyward Lothrop Leavitt, Sr. They lived at 311 Marlborough and he was proprietor of The Newbury Boutique, an antiques store at 252 Newbury. On March 25, 1964, Heywood Leavitt, Jr., transferred his interest in 7 Hereford to his mother. On April 28, 1966, 7 Hereford was acquired from Grace Leavitt by Charles A. Hentz, Jr., and his wife, Tanya Anita (Sedote) Hentz. They lived in Dorchester. He was employed with the Federal Reserve Bank. In the early 1960s, prior to their marriage, he had lived in an apartment at 7 Hereford. The property changed hands and on July 24, 1978, was purchased by Diana Pasley, trustee of the 7 Hereford Street Realty Trust. 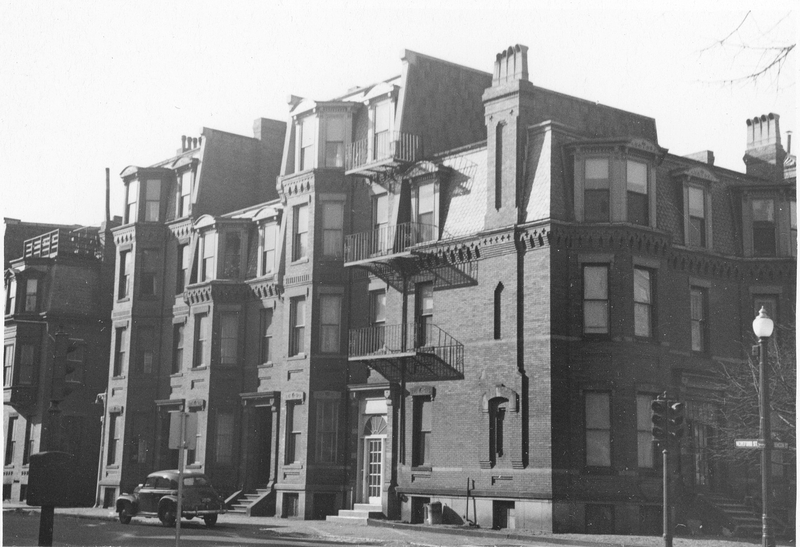 On November 15, 1978, she converted the property into nine condominium units, the 7 Hereford Street Condominium.